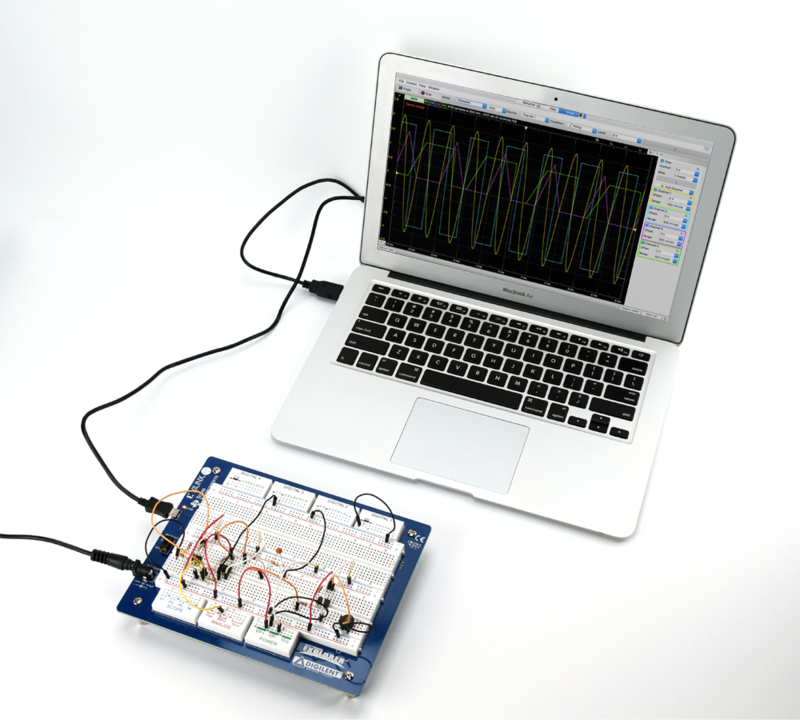 Introducing the New Digilent Projects Portal! As you may have heard, the Digilent storefront has undergone a recent change with a brand new addition to the top navigation bar (as seen in the photo below). The arrival of the Digilent Projects page has been a vision for some time as a place where anyone who has ever created something using Digilent products can share their accomplishments! When visiting the site you will quickly discover an assortment of projects at a variety of skill levels that you can easily peruse for project inspiration. 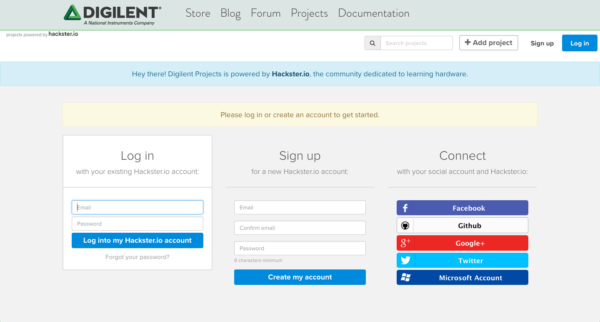 At the top of the page you may notice a familiar interface as the Digilent Projects page is powered by the Hackster.io interface. 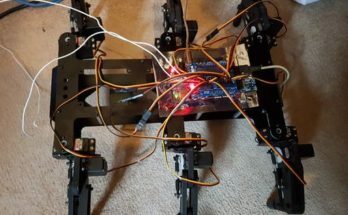 This system was partially chosen due to its simple design and features that make it simple to upload or share your projects. Whether you have already shared your project on another platform (i.e. personal blog, Instructables, etc.) or have yet to bring your creation online, sharing your inventions is easy when following the steps outlined below! 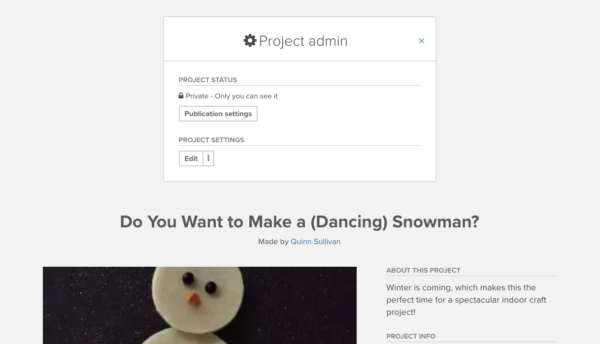 Step One: Begin the process for sharing your project by clicking the “+ Add project” button at the top left side, and create a Hackster.io account (or log in if you have already created one). If you prefer to connect with your other social accounts you can also choose between the five options listed under “Connect”. Step Two: Once you have logged in, you can choose to either upload a new project or import a previously published project. Please note that previously published projects can only be uploaded one page at a time, however there is an option for importing multiple pages at once (see image below). 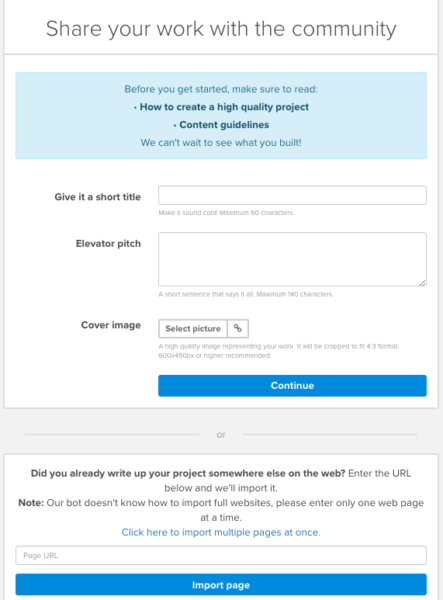 Step Three: The next stage will offer a few options for creating your project from scratch or editing an imported project (such as the one in-progress shown below). At the top of the page you will find tabs for writing the project basics, which include the project name, elevator pitch, and cover image. Make sure that you crop your cover image after uploading as this will be the main feature of your project to future individuals browsing the Digilent Projects page. Under team you have the option to list possible contributors or inform the readers that you are posting the project on behalf of another person. The things tab is most important to consider as this is where you will list project components, software OSs and apps or online services, and any hand tools or fabrication machines that were used. Note: If you used a Digilent product in your project, you will want to list this within the “Things” category for your project to show up on the Digilent Projects page. 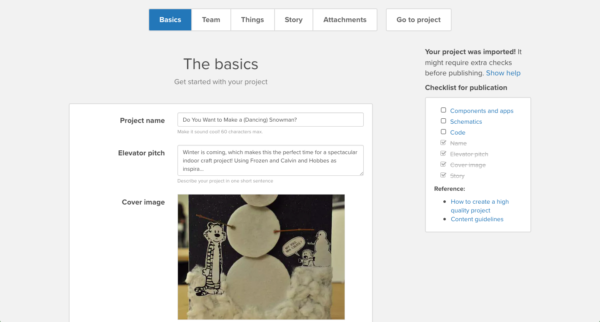 Within the “Story” tab you can really help your project shine by detailing what efforts went into your creation or keep followers up to date with projects that are currently works in progress. 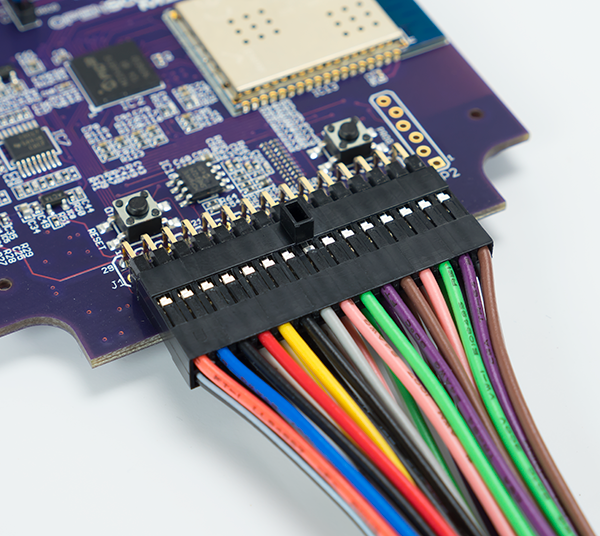 If you used/created any code, schematics and circuit diagrams, or CAD enclosures and custom parts, then you can add these under the “Attachments” tab. Once you have added everything you wish to include, take a quick look at the checklist for publication (on the righthand side of your computer screen) and make sure nothing was forgotten. Step Four: No matter how much time you have at the moment, easily save and resume your editing at any time. Clicking the “My Projects” button at the top of your screen will redirect you to any shared projects or project drafts that are easy to resume at any time you wish! When returning to a ready to publish project draft, you may find a project admin box whereby you can edit publication settings and choose to publish your project (see image below). Step Five: Finally, you are ready to hit publish! The publication settings button (found above in the project admin box) will open a new window detailing your project completion with a publication checklist to check your project completion level. Clicking on this checklist will help you review what areas may have been forgotten during project creation before your project goes live so remember to double check your work! Next you can define your project progress, an important notice for project viewers who may want to quickly identify your project status (e.g., complete or in progress). 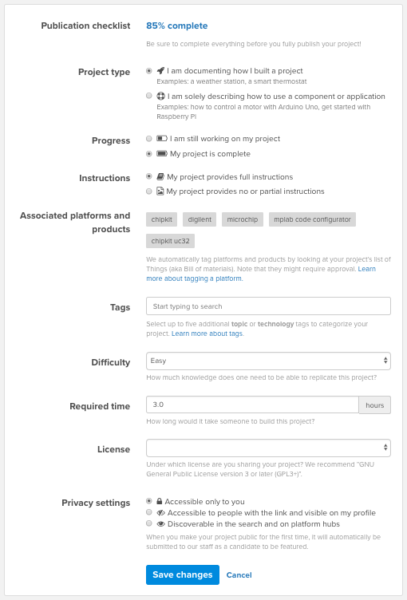 Finally don’t forget to add tags to aid project search, project difficulty level, estimated time requirements, and a creative license to help others know how you would like your project shared if discovered online. We hope you enjoy the new Digilent Projects page and can’t wait to see what projects you contribute! Please let us know what you will be uploading or any suggestions you have for our new page in the comments section below. Stay tuned to find out more about the new Digilent Projects page and follow us on social media to see our favorite project contributions!